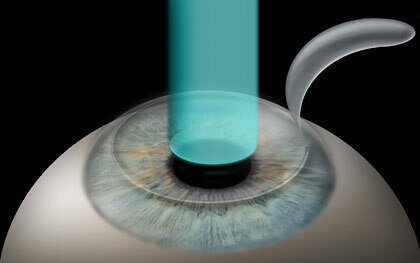 LASIK Surgery for Laser Vision Correction is a type of Laser Eye Surgery that Scott Buck, M.D. has been performing at Northwest Indiana Eye & Laser Center to correct nearsightedness, farsightedness and astigmatism since 2001. LASIK (Laser in Situ Keratomileusis) is the most common type of Laser Vision Correction performed in the United States today and is a good choice for most patients. For some patients PRK (Photorefractive Keratectomy) is the preferred type of Laser Eye Surgery. During your consultation at Northwest Indiana Eye & Laser Center we will be taking all the measurements necessary to help you determine which type of Laser Vision Correction is going to give you the best possible results. We will take the time necessary to review our examination results with you and answer your questions so that you can make informed decisions about the various types of Laser Eye Surgery for Laser Vision Correction. LASIK Surgery is a type of Laser Eye Surgery called “lamellar eye surgery” because it is performed between the layers of corneal tissue by creating a very thin flap of corneal tissue that can be lifted and the laser energy applied, followed by returning of the flap to its original position without the need for sutures or stitches. LASIK offers patients a Laser Vision Correction procedure with minimal discomfort and a quick visual recovery. To begin your LASIK procedure, Dr. Buck will instruct the staff to place a few eye drops in your eyes to numb the surface of your eye to make you comfortable during your treatment. You will be seated in a relaxed waiting area while the drops have a chance to begin working. A technician will then accompany you into the Excimer Laser and help you to position yourself comfortably on the moveable “bedlike” area that is actually part of the laser system. Dr. Buck will gently place a small instrument between your eyelids to help you remember to keep them open during your LASIK surgery. 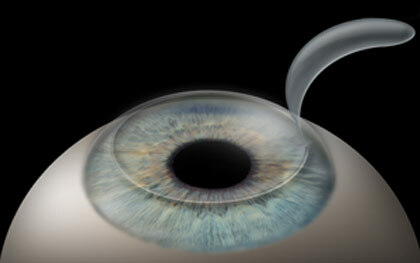 Dr. Buck will then create a very thin layer, which is a “flap” of clear tissue in the center of the cornea. He will then carefully fold the flap over and allow the inner layer of the cornea to be visible so that the laser energy can be applied. 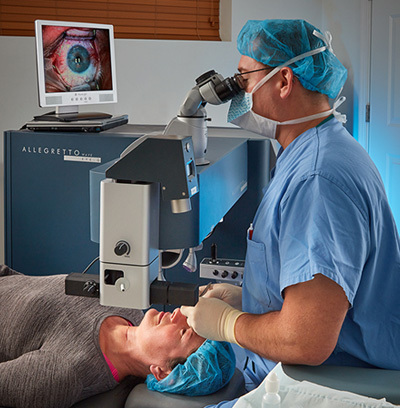 Based on your examination, your prescription and other measurements and calculations collected at your LASIK consultation, Dr. Buck will instruct the staff to program certain information into a computer that will monitor and control the actual application of the laser energy. The actual laser application can take from 4-30 seconds depending on the amount of correction that you require. You will be asked to look at a small light and to try and hold your eyes steady. There is no need to be concerned about moving your eyes during your treatment as the laser will actually “scan” the position of your eyes to identify the exact position of your eye and will then “track” and adjust its position in order to keep perfectly aligned with your eye movement. Upon completion of the laser application, Dr. Buck will have changed the curvature of your cornea so that it will be the shape necessary to correct your vision. Dr. Buck will then gently replace the “flap” back into its original position. 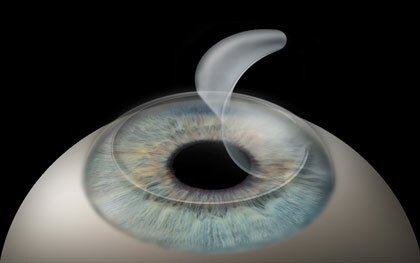 Since the cornea is able to “stick” to itself, there is no need to use sutures or “stitches” to hold it in place. The nature of the LASIK procedure is that it permits the healing and visual recovery process to be quick and predictable for most patients. For a few days after your LASIK Eye Surgery, you will need to be careful not to rub or bump your eyes too much. It is expected that you will have a mild “sandy” or “gritty” sensation during the first day or so after your LASIK surgery. This is normal. Dr. Buck and his staff will give you complete instructions regarding eye drops and medications to use to help the healing and visual recovery process. Dr. Buck will require that you return for scheduled follow-up visits to check the healing process, regardless of how well you think you are doing. Most LASIK patients at Northwest Indiana Eye & Laser are able to pass the Indiana and Illinois Motor Vehicles Eye Test without eyeglasses or contacts within a day or so after their LASIK Surgery with Dr. Buck. PRK has been performed in the United States since 1995 and as such has withstood the test of time in terms of safety, efficacy and predictability. The PRK procedure is somewhat similar to LASIK in that a laser is used to reshape the cornea in order to correct your vision. The key difference between PRK and LASIK is that no “flap” is created during PRK. Instead, the laser is used to produce your optical correction by reshaping the outermost surface of the cornea, rather than under a flap, as in LASIK. PRK requires the removal of a thin layer of the corneal epithelium, which may produce varying degrees of temporary discomfort for up to a few days after your treatment. In general PRK provides a slower visual recovery than LASIK.With PRK, Dr. Buck will often prescribe additional medications and a thin, soft bandage contact lens to make you more comfortable for a few days after your treatment. PRK has a distinct place for some patients. who are in certain military assignments or roles and who are active or reserve military personnel. You should feel free to discuss any fears, concerns, questions or thoughts about LASIK or any Laser Eye Surgery procedure for Laser Vision Correction with Dr. Buck or the staff. We will be pleased to spend whatever time is necessary to review any information about the PRK or LASIK procedure, what to expect on PRK or LASIK surgery day, follow-up care, fees and affordable “no money down” easy monthly payment plans that will fit into your budget.